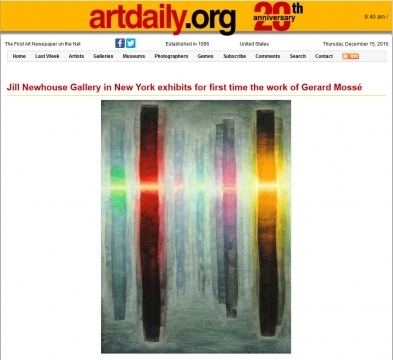 Jill Newhouse Gallery is exhibiting for first time the work of Gerard Mossé. Mossé's paper paintings are done in oil on vellum, referencing Old Master technique. Mossé’s methods are painstaking; he spends years making each work, wiping away pigment and building it up again in thin washes to create a luminous, textured quality that is truly unique. 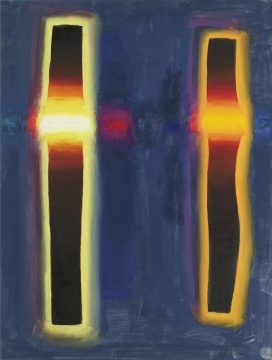 Influenced by his time as a master potter and glazer, Mossé’s art works have a dense luminosity which gives the viewer the sensation of looking in the sun. 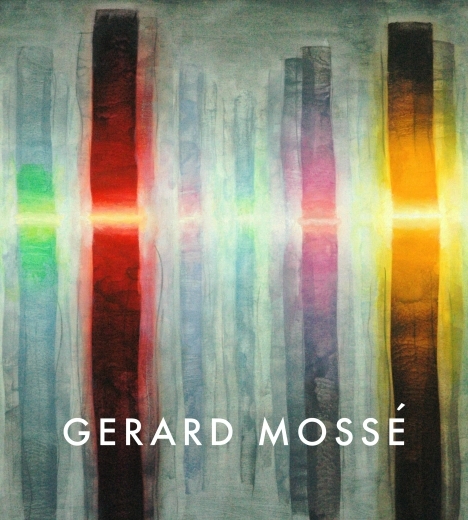 In the catalogue essay, art critic David Cohen, rightly christens Mossé a painter of light. "As a composer of images, Mossé is unabashedly figure-ground. He nests his characteristically binary forms – menhir-like and figural, naturalistic and abstract, living and timeless – in “family of man” constellations that recall a sculptural group by Barbara Hepworth or an installation of works by Anne Truitt. Their jostle and swagger sometimes gives them a life-like quality, other times precarious tilt can put viewers in mind of renaissance towers (Bologna, San Gimignano) that are at once communal and competitive. In either case, they stand apart from the receding and receiving ground around them. And then there is the light. The glow, the glare in Mossé is his signature device in which color and glaze are deployed not merely to define light through subtle contrast of complementary hues (the chiaroscuro of George De La Tour, the luminous ingenuity of William Trost Richards) but to represent light with aggressive independence, deceiving the eye into thinking there must be some actual source of illumination encased within the picture, or behind it, bright enough to pierce both canvas and pigment. Even when we know that’s not the case the fantasy persists. Nor are there representational devices like halos or emanations denoting rays of light (Van Gogh, Joseph Stella) but instead patient, deliberated upon layer-upon-layer of chroma that collectively achieve pure dazzle." Gerard Mossé currently works out of his studio in New York City.